No walk in restaurant is complete without a menu board that is organized and highlights important items. 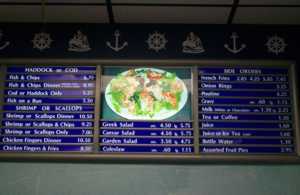 Inform your customers, quickly, easily and professionally with quality menu boards. With a variety of options, menu boards can be manufactured in any design, space and budget requirements. We will gladly work with you to create a menu board that is fitting for your business. Click on the menu board images below to enlarge them. You can also view some of our sign work on our sign portfolio page.